OUR HONOR FLIGHT MISSION SET FOR SEPTEMBER 29th, IS ONLY 3 SHORT WEEKS AWAY! Sept 9, 2018 – Honor Flight Central Florida is pleased to report that our next and last scheduled flight for 2018 is quickly approaching . With a flight mission orientation scheduled for Saturday Sept 22nd, we will be hosting 50 of our home town heroes and 50 of their dedicated Guardians scheduled to travel to our Nation’s capital the following Saturday, September 29th. We are excited to be touring the Veteran Memorials on a mission of honor so that our heroes can view and reflect at those memorials built for them. It’s our deepest hope that we can provide a day that will show these brave and valiant men and women that their service is appreciated and that their sacrifices and those of others many since departed, will never ever be forgotten. Our group includes 12 Veterans of WWll, 19 Veterans of the Korea War and 19 Veterans of the Vietnam War era. Two of our Honored Vets are women that served our Country as Vietnam era Vets in the Army. Our most senior Honoree is a 98 year old WWII Veteran of the Army & Air Force who served as a famed Tuskegee Airman. Our group served in the Army, Air Force, Navy and Marine Corp. Many served in multiple war eras. Our arrival back to Orlando the evening of Sept 29th will be on Southwest Airlines Flight # 6293 due in MCO (not Sanford) at 9:15PM. We hope you will save the date and mark your calendar so you can play an important part in the honor due these heroes, by joining our ground welcome team to provide a welcome home that these heroes deserve. Welcome home events are for the family. Bring flags, bring signs, and be prepared for a once in a lifetime chance to show each and every Veteran what their service and sacrifices means to you and America. If you can read this, thank a teacher, but if you can read this in english, thank a Veteran! Honor Flight Central Florida is blessed by the generosity of Supporters & Donors that help make the planes fly! Christmas is the giving time of year, and Honor Flight Central Florida has been truly blessed with the continued support of corporate donors that makes it possible to continue our mission. We are very pleased to recognize each of those organizations that give to support our mission and ask that you recognize and patronize them for their generosity. One Senior Place of Altamonte Springs, has provided funding that will allow us to offer three of our Honored Veterans Honor Flights of their own. Thanks to One Senior Place for their continued support of our mission. LIMU Company of Lake Mary, has once again made it possible to keep the planes flying. Their generosity makes it possible for us to provide absolutely free Honor Flights to about 30 of our hometown heroes. Thanl you to LIMU for offering their continued support of our mission since 2013. Winter Park Construction will be sponsoring a team of Guardians to accompany our hometown heroes on their Honor Flight on the fall of 2018. Thank you to WPC for offering their continued support of our mission since 2012. Tijuana Flats “Just in Queso” Foundation representing the Avalon Park and Winter Springs locations, has generously donated funds to sponsor Five Guardians that will accompany our honored Veterans on their Honor Flight. Thanks to Tijuana Flats Just in Queso Foundation for their continued support of our mission. We want to thank all our corporate donors and sponsors, without whom our mission could not be carried out. Honor Flight Central Florida is pleased to announce we have scheduled our first two flights for the Spring of 2018. We plan to take 25 Veterans along with 25 Honor Flight Guardian donors on each mission to our Nation’s capital so that our hometown heroes can view and reflect at the Memorials built to honor them. We are proud to provide Honor Flights at absolutely no charge to our Honored Veterans with thanks to the generosity of those who support this great mission. We give priority to the Veterans that apply in the following order: Seriously ill Veterans of any era will be served first, then our WWII and Korea era Veterans next, and finally, the Veterans who served this nation during the Vietnam era, all on a first-come, first-served basis using the guidelines stated. While we have waiting list, we are accepting applications for both Veteran Honorees and Guardian level donors. As a Guardian, you will have the privilege of accompanying one of our hometown heroes on their own Honor Flight and be there to support them on an emotional day where they will experience recognition and thanks for their sacrifice and service to our Nation. Those who hold our Veterans in esteem and join us as Guardians, will have a profoundly rewarding personal experience that will stay with you for a lifetime. Kindly consider joining us as a Guardian on a future flight and dedicate yourself to those who answered the calling to wear the uniform of our armed forces and protect us and America. If you know a Senior Veteran that would like to join us on a flight, we will do our very best to see that they are treated like the heroes we believe they are. We typically visit the WWII, Korea and Vietnam War Memorials, several of the military branch Memorials and Arlington National Cemetery on our flight missions. We fly up and back on the same day, and always schedule our flight missions for Saturdays in the Spring and Fall seasons. Applications for both Guardians and Veterans to travel with us can be found here on our website. We ask that our Guardians donate to Honor Flight Central Florida to cover their own cost of flight mission expenses and will provide an acknowledgement of your donation for tax purposes. If you know a Senior Veteran that has never seen their Memorial, we would be grateful if you shared your knowledge of what we do. We are so very proud to serve all of those who served us by providing these flights. We believe as Will Rogers did – “We can’t all be heroes, because someone has to stand on the curb and clap as they go by”. Join us in our mission to recognize and applaud the heroic and valiant among us. Tell a Senior Veteran about us, or seize the opportunity to play a key role in our mission by pushing their wheelchair and showing your own appreciation for what they have done for all of us. Honor Flight Central Florida is a 501C-3 all volunteer organization. The money we raise goes directly to our mission and we never ask our Honorees for a single thing, other then to enjoy the adulation and honor we aim to provide. You can also learn more by calling us at 407.203.7010. Twenty-four more Central Florida Veterans will take their Honor Flight on Saturday, October 21st! On October 21st, we are proud to be conducting another 2017 flight mission to Washington DC to provide 24 Central Florida Veterans with their own Honor Flight. Providing them a day of Honor to view and reflect at their memorials allows them to see our Nation’s appreciation for their service and sacrifices. Many have never seen their memorials or been formally recognized for what they have done for all of us while wearing the uniforms of our Military. Each wrote a blank check to the people of the United States for an amount up to and including their lives. Our Honorees include 7 Veterans of WWII, 8 who served during the Korean War and 9 who served during the Cold War and Vietnam era. They served our Nation in the Army, Navy, Air Force, Marines, Coast Guard and Merchant Marine. Our youngest Honoree is 68 and our most Senior is 101 years old. A number of them served in multiple conflicts and more than one branch of our military. Two of our Honorees are women, both of whom served during WWII. President Harry Truman said it best at the close of WWII when he stated “Our debt to the heroic men and valiant women in the service of our country can never be repaid. They have earned our undying gratitude. America will never forget their sacrifices”. Those words are enshrined in a panel on the WWII Memorial and we at Honor Flight Central Florida couldn’t agree more. We hope that you also agree, and that amid your own busy schedules you’ll take time to play a role in their Honor Flight by joining in a welcome home to celebrate and appreciate their service next Saturday October 21st. Our tour will take us the WWII, Korea and Vietnam Memorials and to Arlington National Cemetery to witness the changing of the Guard at the Tomb of the Unknown Soldier. We will be arriving home from their Honor Flight to Orlando International Airport at 9:55 PM on Saturday evening and want them to see an airport full of grateful folks who will make time to put them first as they did for all of us. Our arriving flight in to Orlando International is Southwest #3639 and we expect to be entering terminal A around 10:15. Join all the others who regularly attend these welcome home events by bringing family and friends, flags and signs of appreciation, to show your gratitude. While we don’t know them all, we owe them all, because we can’t all be heroes – some of us have to stand up and clap as they go by. Check with Southwest Airlines Saturday evening to confirm our on-time arrival, and be there to show we will never forget their sacrifices. Share this post with your own friends and family to provide a greeting home that is well deserved and will be a cherished memory for each of our Heroes. Honor Flight Central Florida appreciates every donation to our mission. You make our planes fly. 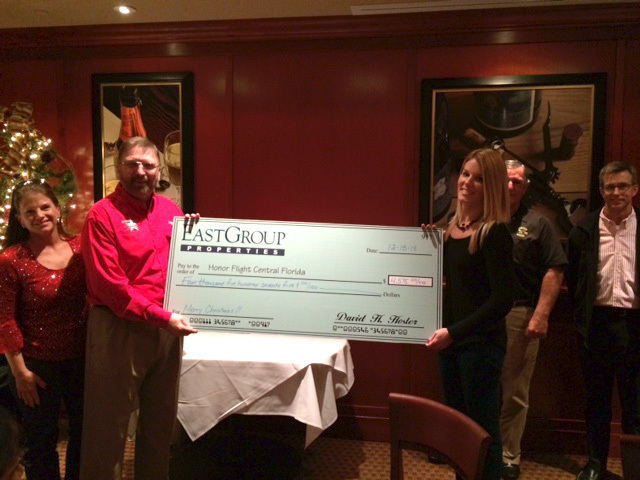 This month we received a $4475 check from EasGroup Properties, their employees and vendors during a holiday luncheon. Thank you for your support! On January 7th, 2012 four of our board members met with 16 of the Central Florida WWII Veterans who are on our waiting list. We have over 75 WWII Veterans on that list and more coming in every day with an average age of 88. Our October 7th, 2012 flight preparations are underway. Every WWII Veteran is assigned a Guardian to assist them through out the flight. Your participation as a Guardian will be a memorable experience as you visit the WWII Memorial with a veteran who served in WWII. We also visit Arlington Cemetery to see the Changing of the Guard Ceremony at the Tomb of the Unknown Soldier. We stop at the IWO Jima, Korean and Vietnam Memorials during our day trip to Washington, D.C.
Email us today at honorflightcentralflorida@gmail.com to request a speaker to your group.